How was your weekend?? Since we didn't have any events this weekend, we had an opportunity to go out and explore some of the wine and beer options in town. I spent Sunday at California Vintage for their 'Sunday at the Bar' series. This is the second time I've attended (in two weeks!) and both were excellent. It started with a nice, fruity Sauvignon Blanc. This is quickly becoming my new favorite white wine. I had always been partial to Pinot Grigio for the crispness, but I'm totally diging the fruity summery taste of Sauv Blanc. We have a really nice one here from Bordeaux that I love! It's balanced with Semillion which brings a creaminess to the acid from the Sauv grape. Yum Yum. Back to Cali. The flight continued with a Chentella Viogner which I also really loved for totally different reasons. This had more earthiness and would be a lovely accompaniment to a fishy dinner. Then we switched to the reds; R&B Rockstar, Three Mataro, and Peachy Canyon's Zinfendel. There's just something about Cali wines that is so tasty. I ended up taking the Rockstar and Zin home. Now to find the perfect pairing. What do you think? The afternoon was finished with an amazing Aero-Port which was a white porto. Who knew that even existed? Not me until yesterday, and I'm telling you it was good enough to bathe in! If you like Stout, drink this! Since I don't get down to Soho as often as I'd like, I try to make the most of every trip. And to me, no visit is complete without a stopover in the Globe. <3 The Globe! 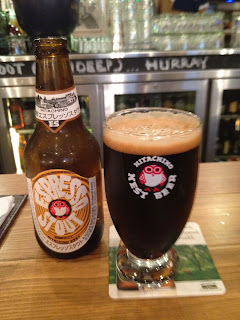 As always I ask Toby his thoughts on my random selections from the vast menu, and this, like every other time, he lead me to perfectiong; Hitacho Nest Espresso Stout. This Japanese beer no joke poured out of the bottle like a midnight syrup. The first sign of deliciousness. Despite the booziness, it tasted smooth, rich, and full. This is my kind of beer. I recommend you go in and try it while this cold spat lasts! I finished the evening with a glass of South African red. I don't recall what it was as I don't usually like South African wines. Toby assured me it was good and poured me a taste, and I was shocked that it was really smooth and elegant. Not your typical SA wine. That was my Sunday in wine and beer. Tell me about your weekend!